It’s been a whirlwind month. I got home from South Africa (more on that to come), we had Christmas with our families (also more on that to come) and moved to Mississippi (definitely more on that to come). It’s been raining nonstop for a week, which means we haven’t been too motivated to get much done in the way of unpacking and organizing. Instead, we’ve been playing plenty of board games and I’ve been spending more time in the kitchen. We had this for dinner the other night and, although it wasn’t the first time I’ve made it, I was struck by how fast it all came together. 30 minutes from gathering the ingredients to sitting down to eat? I’ll take it! As per request, here’s the recipe, adapted from Terry Walter’s Clean Food. You could probably use just about any small squash; the original recipe suggests buttercup. The stuffing is excellent as is, but I’m sure you could swap out ingredients as needed. For example, mirin is sometimes hard to find- it’s a sweet, white cooking wine common in Japanese recipes. Wash the squash and cut it in half. Scoop out the seeds and rub the skins with olive oil. Place open side down on a parchment lined baking pan. Roast for 25 minutes or until soft throughout. Turn off heat, but leave squash in the oven to stay warm until it’s ready to be served. In the meantime, combine quinoa in a pot with water or vegetable stock and a pinch of salt. Place over high heat and bring to a boil. Reduce heat to medium-low, cover and simmer until the liquid is absorbed (this should take 10-15 minutes). Remove from heat and set aside. In a dutch oven (a.k.a. large pot) over medium heat, saute shallots and celery in 1 tablespoon olive oil until soft. Then add the apricots, sage, parsley and mirin and saute for another 3 minutes. Fluff the quinoa and add to this mixture. Add lemon juice, zest and the remaining tablespoon of olive oil and saute until heated through. 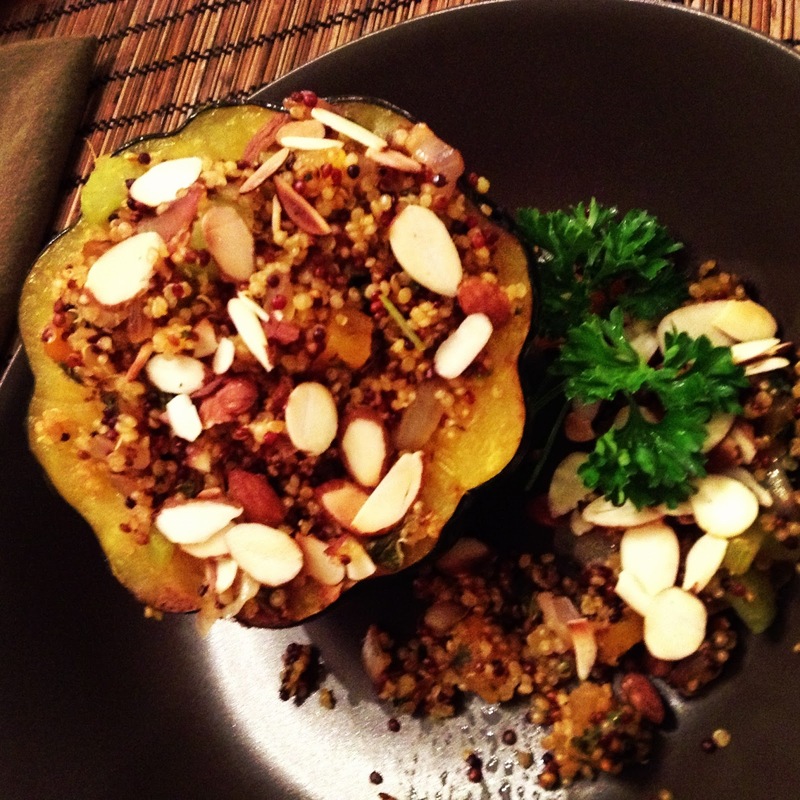 Fill individual squash bowls with stuffing, garnish with toasted almonds and parsley sprigs and serve. Delicious!